so this weekend past was the Gove Women’s Fishing Competition, and as many will know, I refuse to be on the same boat as a group of competitive fishers, especially if one of them is my wife! sal teamed up with her friend deb and her husband, marco, took on the role of skipper for them. my compromise was to offer to bring the big boat so they could stay out on the water on saturday night, to that end sal & i launched on friday afternoon and spent the night at the granites enjoying a few beers, a nice steak and a glass or two of red. sal was picked up by deb & marco at 6:30 on saturday morning and they headed out fishing, we agreed to meet up at breakfast island for lunch, so i made my way up there, and anchored up to enjoy a morning swimming and relaxing while the girls fished! after lunch the fishers headed off and i cleaned up and then headed off to the dinner and overnight rendevous, the north side of wigram island. we enjoyed a dinner of fish tacos and spent a very comfortable night anchored in behind a sand spit and a couple of islands. we had a rain squall in the morning as we made coffees which lasted an hour or so and delayed the start to fishing slightly. sunday morning the girls decided to fish the north side of wigram and around miller island so i steamed over to miller island and set up for lunch, we had a haloumi and chorizo salad with a cold beer for good luck! after lunch i set sail for home and the girls headed off to fish attack shoal and the bromby islands before making their way back to the ramp at the end of the comp. while the girls probably wont win any prizes, as they didnt really get amongst as many big fish as they would have liked, they had a great time and a lot of fun, and from my perspective we had a lovely weekend away and it was very relaxing for me! storm coming into gove harbour. we did about 90nm in dhamuku, and 9 hrs of motoring, we used 144l of fuel for 1.6l per nm and 16l per hour. sal & i have just spent 5 days on our boat at the wessel islands, ‘bliss’ is the word that popped in my head when i thought of one word to describe the 5 days. i guess the dream of owning our own boat that we could live aboard for extended periods and continue to explore the paradise we live in, had long been in our minds, and we had begun to have some sense of the potential from our few previous tips on the new boat. this was truly what we had envisaged though, exploring new bays, beaches, islands, creeks, fishing spots, swimming holes, while wining and dining on the water! we had decided that the week between xmas and new year was perfect for an extended trip, we were both off work and the weather was looking perfect. kai announced his intention to stay at home as 5 days stuck on a boat with his ‘rents was more than a teenager could bear – we were torn between knowing what he would miss out on, and the thrill of having 5 days to ourselves, on the water! we decided to leave on the wednesday after boxing day, giving us time to recover from xmas excess and prepare the boat, we left mind morning and headed north, our last human contact was a short radio converstion with dave who was out on his boat with his family and we chatted as we passed near bonner rocks, we pressed on north in flat seas towards cape wilberforce and then thru the passage between cotton and wigram island and across the donington sound to raragala island in the wessel islands. the day just got calmer and calmer as it went on and it completely glassed off by midday, with the flooding tide under us we made good time and dropped anchor in our chosen anchorage on raragala island for a late lunch. 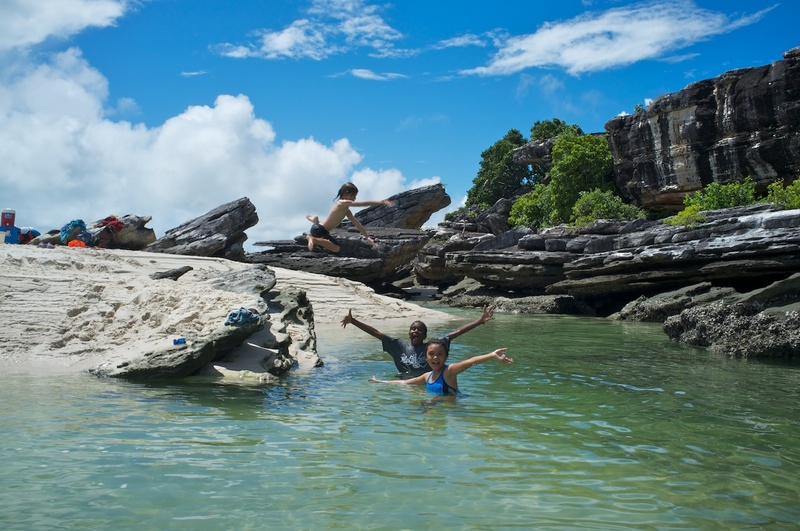 we chose to anchor in this unamed bay on the south side of raragala island to allow us to explore the southern end of the island in the tinny, while having close access to one of our favourite fresh water swimming spots on the island, and the fishing in raragala bay itself. we were forced to eat a non-fish dinner as we didnt catch anything in the afternoon we spent exporing the local beaches and bays. after a pleasant night i woke up early and made us a coffee with my ‘glamping’ caravel, a 60 year old, manual lever machine that i have converted to non-electric service, and then jumped in the tinny and headed round to raragala bay to fish the rocky headlands and managed to drag a couple of nice mangrove jacks out of the rocks for dinner. we spent time at a spring fed freshwater swimming spot that we had visited in a previous trip to the wessels on a charter, it has a waterfall that falls into a large, tree shaded pool and is just behind the beach, so its easy to get to in the boat and a very refreshing spot to visit. 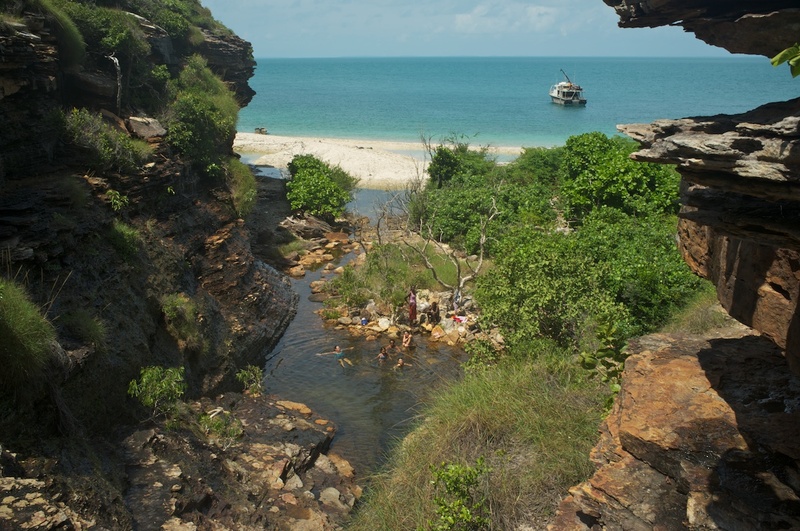 we also explored the coast down to the southern end of raragala island, beach combing along the way and then investigating whether it was possible to pass between raragala island and jirrgarri island to get round to the north side of raragala island. the eye of the needle! the chart suggested there might be a narrow passage that was navigable, and on arriving there we were able to find a very narrow passage between jirrgarri island and a small unnamed island to its north, it was probably 30m wide but quite deep, reef and sand shoals extended north with a narrow but deep passage between them. we were there right on low tide so we figured if we could get the tinny through and find a safe passage then it ought to be possible to get the big boat through safely at high tide. i knew i would have to time it right with the tide only just turned because otherwise it was obvious the current would rage through the narrow passage. after returning to the anchorage we decided to have lunch and then weigh anchor and have a crack at getting through what I named the “eye of the needle”! in the end it went pretty smoothly, there was about 4 kts of tide against us and we got through safely and then headed up to a new anchorage at guruliya bay. we spent the next couple of days at guruliya bay, there was plenty of exlploring of the beaches, bays and creeks either side of the anchorage and also plenty of good spots for fishing. in particular the head of the bay has a system of small mangrove creeks and rocky headlands that suggested plenty of barra and jack action. while it wasnt exactly going off, I manged to get a couple of nice barra and some more jack to keep the plates filled with fish! the weather continued to be fantastic, enough breeze to keep us cool enough to sleep at night, but no storms or rain. on our seond last day we weighed anchor and headed for the hole in the wall, or gugari rip, to travel back to the southern side of raragala island, into raragala bay for a night before heading home. one again conditions were perfect and I timed the run through the hole in the wall for an hour or so below low tide so we would have some current against us, there was a bit more run than i expected, we had about 4 knots against us in the middle of the hole in the wall, but it presented no issue. in her 15 years in arnhem land, sal has caught most fish species, but one that had eluded her to date was a mangrove jack, so i made sure that while we were in raragala bay she came and had a fish with me to get her first jack. in the end it was a decent fish and she was pleased to tick it off her list! the second one she caught was hilarious and i wish i had caught it on video, she flicked her lure perfectly and enticed a small rock cod to rush out and grab the lure, as she got it close to the boat, 4 jacks stormed out from under a rock shelf, the biggest one grabbed the rock cod and tore it off the lure – then one of the smaller jacks grabbed her lure! new years eve we weighed anchor in the wessel islands for the final time and pointed the old girl south, towards home, we had an uneventful run across donnington strait and into malay roads before rounding cape wilberforce and lined up gove harbour. we stopped for a troll on a favourite shoal on the way and sal pulled up a stonker of a mackerel to finish the trip on a high note! all in all a magical 5 days, absolutely what we envisaged doing when we bought this boat, to be able to do it as just the two of us with no other people seen or talked to for 5 days was extra special, no phones, internet, tv, computers etc was also a pleasant change! we are truly lucky to have such an incredible landscape and environment right on our doorstep – and to have the means to immerse ourselves in it and explore the magical coastline. this weekend we chartered a local boat, the hama pearl ii and set off for the Wessel Islands for a few days, joining myself, sally & kai were our friends will, dhalulu, siena, arian, melissa and billy. the trip was a sort of 50th birthday trip for will & I to drag out the celebration of our century. the plan was to head to burston bay on the south east side of marchinbar island for the 3 days, but due to a bit of swell we decided to move that night around to the north and sheltered side of marchinbar to a bay called jensen bay. basically we spent 3 days exploring, hunting, fishing, eating, drinking, talking, resting and generally having an amazing time! we left jensen bay on monday morning and steamed back to the hole in the wall and came thru there mid morning, before pulling up at the waterfall pictured above on raragala island. the kids had a ball, as can be seen in this shot at the lagoon at burston bay. the hama pearl ii was a perfect boat for the trip, air conditioned down below, lots of room, a fully equipped galley and 2 tinnies for running around. the crew, brad & marty, were fantastic and nothing was too much trouble for them – we will definitely be booking them again! the weather really turned it on for us too, despite my fears it might blow up, it actually just got better and better, clear days, light breezes and no swell – very lucky for this late in april. there are heaps of photos on our web gallery so pop over and have a look there. finally, the trip was made totally awesome by arian popping the question to melissa on sunday evening, while they were out in one of the tinnies having a sight see and fish. luckily the answer was ‘yes’, so he brought her back in the tinny!